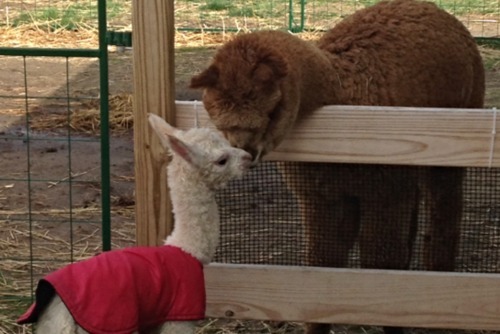 Winding Creek Alpaca Farm is a farm located in Egg Harbor Township, New Jersey owned by Mike and Sheri von Fischer. Welcome to Winding Creek Alpaca Farm! We started on the alpaca journey 5 years ago and had our starter farm in Southampton, NJ. Our herd of 22 huacaya alpacas are from some of the finest lineage in the country. We have recently relocated to a 22 ac farm in Egg Harbor Twp, NJ near the beautiful NJ shoreline. We are about 15 minutes from Ocean City, NJ. The farm is run by Mike and Sheri von Fischer. Mike has been in the sales and service industry for 25 years. Sheri is a pediatric nurse who is currently working in the medical device sales arena. Our long term goal is to provide diverse genetics to our customers through our foundation females. We take pride in raising happy, healthy, friendly animals who enjoy our company. Our mission is to breed only the finest alpacas, educate the public about these wonderful creatures and to ensure our animals have long, healthy lives. Come for a visit to meet our animals and learn more about raising alpacas. 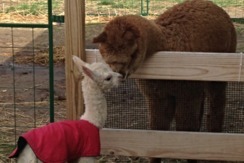 Let your humming begin at Winding Creek Alpaca Farm. Call to schedule your visit today!